Matthew 18:15–17 Moreover if thy brother shall trespass against thee, go and tell him his fault between thee and him alone: if he shall hear thee, thou hast gained thy brother. But if he will not hear thee, then take with thee one or two more, that in the mouth of two or three witnesses every word may be established. And if he shall neglect to hear them, tell it unto the church: but if he neglect to hear the church, let him be unto thee as an heathen man and a publican. Romans 12:17–21 Recompense to no man evil for evil. Provide things honest in the sight of all men. If it be possible, as much as lieth in you, live peaceably with all men. Dearly beloved, avenge not yourselves, but rather give place unto wrath: for it is written, Vengeance is mine; I will repay, saith the Lord. Therefore if thine enemy hunger, feed him; if he thirst, give him drink: for in so doing thou shalt heap coals of fire on his head. Be not overcome of evil, but overcome evil with good. Ephesians 4:1–3 I therefore, the prisoner of the Lord, beseech you that ye walk worthy of the vocation wherewith ye are called, With all lowliness and meekness, with longsuffering, forbearing one another in love; Endeavouring to keep the unity of the Spirit in the bond of peace. Philippians 3:15–16 Let us therefore, as many as be perfect, be thus minded: and if in any thing ye be otherwise minded, God shall reveal even this unto you. Nevertheless, whereto we have already attained, let us walk by the same rule, let us mind the same thing. Hebrews 12:14–16 Follow peace with all men, and holiness, without which no man shall see the Lord: Looking diligently lest any man fail of the grace of God; lest any root of bitterness springing up trouble you, and thereby many be defiled; Lest there be any fornicator, or profane person, as Esau, who for one morsel of meat sold his birthright. James 1:19–20 Wherefore, my beloved brethren, let every man be swift to hear, slow to speak, slow to wrath: For the wrath of man worketh not the righteousness of God. 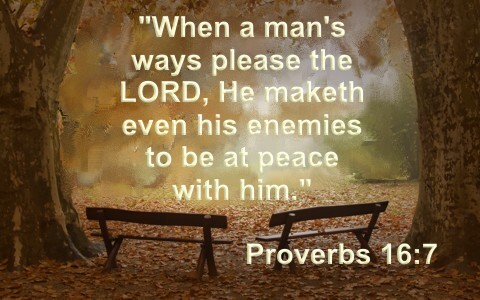 Proverbs 15:18 A wrathful man stirreth up strife: But he that is slow to anger appeaseth strife. 1 Peter 3:8–9 Finally, be ye all of one mind, having compassion one of another, love as brethren, be pitiful, be courteous: Not rendering evil for evil, or railing for railing: but contrariwise blessing; knowing that ye are thereunto called, that ye should inherit a blessing. Matthew 6:14–15 For if ye forgive men their trespasses, your heavenly Father will also forgive you: But if ye forgive not men their trespasses, neither will your Father forgive your trespasses. Luke 17:3–4 Take heed to yourselves: If thy brother trespass against thee, rebuke him; and if he repent, forgive him. And if he trespass against thee seven times in a day, and seven times in a day turn again to thee, saying, I repent; thou shalt forgive him. Galatians 6:1–2 Brethren, if a man be overtaken in a fault, ye which are spiritual, restore such an one in the spirit of meekness; considering thyself, lest thou also be tempted. Bear ye one another’s burdens, and so fulfil the law of Christ. Colossians 3:13–14 Forbearing one another, and forgiving one another, if any man have a quarrel against any: even as Christ forgave you, so also do ye. And above all these things put on charity, which is the bond of perfectness. The way to avoid disputes and disagreements is to be sure you are thinking on the right things and being careful what you say. Your words are powerful and when they are delivered wrong, you can stir up strife. We also have plenty of guidance from the Bible on how to conduct ourselves when we find that we are in the midst of an argument. Finally, don’t ever lose sight of the importance of forgiveness and restoration. Relationships need to be cultivated and once you get rid of the weeds you need to feed them with tender love and care. Previous post: Do Apparitions Of Jesus And Mary Come From God?